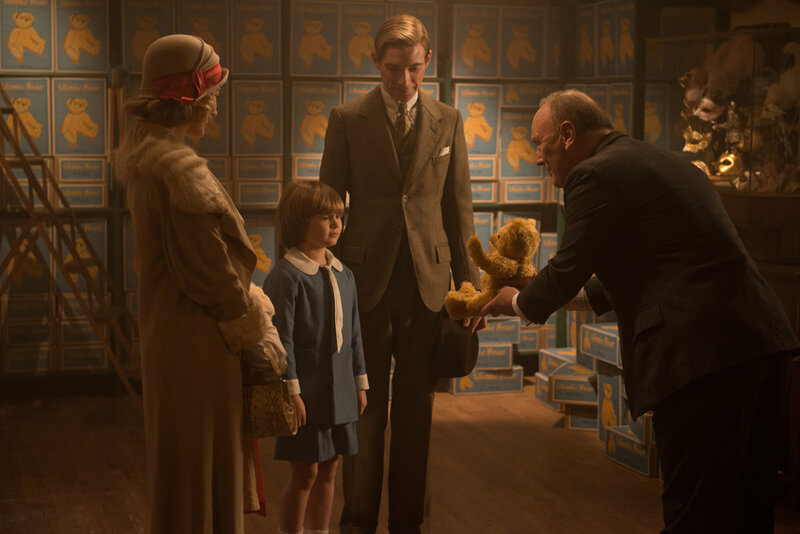 Edwin Arnaudin: Like many children, I grew up reading A.A. Milne’s Winnie the Pooh stories and eventually learned the basics of how they came to be — but had no idea the backstory was as dark as Goodbye, Christopher Robin suggests. Did you? Bruce Steele: I knew nothing about Milne, or even that there was a “real” Christopher Robin, his son, known in the family as Billy Moon. I had some vague knowledge that Milne also wrote grown-up books, but I didn’t know he was a playwright and an antiwar crusader, in part as a result of his PTSD from World War I. It appears no one in the family had a very happy life, which makes the Pooh stories so much more poignant. Edwin: All of the above details are stirred together to generally moving results in Simon Curtis’ biopic, though I found the opening childless stretch with Milne (Domhnall Gleeson) and his wife Daphne (Margot Robbie) somewhat sluggish. Bruce: Daphne is a selfish wife and distant mother, whose whims Milne just indulges, which alienates the audience from both of them. 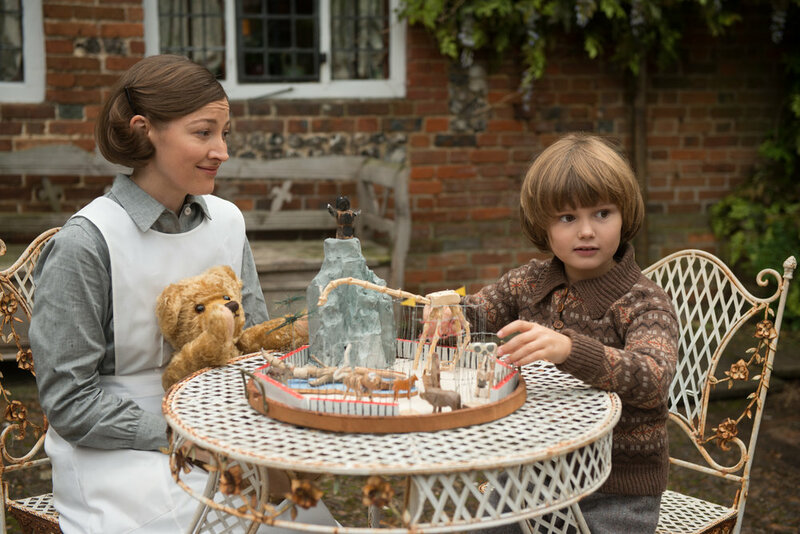 The real emotional core of the movie is Billy’s nanny Olive, called Nou, played by the always wonderful Kelly Macdonald (Boardwalk Empire). Did you love her as much as Billy and I do? Edwin: She’s delightful, but I also got a kick out of Daphne voicing Billy’s stuffed animals. That’s of course the seed for the Hundred Acre Wood tales, which start falling into place while she hides away in London and Milne a.k.a. Blue and his son bond over imagination. The formation of their new relationship is by far my favorite stretch of the film — and I imagine most viewers will say the same. Bruce: I expect you’re right. The movie suggests two weeks of filial bliss led to a literary sensation, thanks in part to Milne’s fellow WWI vet friend, illustrator E.H. Shepard (Stephen Campbell Moore), who joins the idyll. Sadly, the promotion of the Pooh books, pimping out Billy as their spokesmodel, amounts to child abuse, which Olive recognizes but Milne seems dully unaware of. I found that rather inexplicable. Did you? Edwin: It’s an odd response from a man who seems to know better. The trickery Blue and Daphne put Billy through comes a bit out of nowhere, yet it inspires new depth from young Will Tilston, whom I thought was terrific in his film debut. Bruce: You certainly feel his pain when he’s unhappy. And when he turns 18, he becomes the equally fine Alex Lawther, the young Alan Turing from The Imitation Game, who finally confronts his dad in a way best left to viewers to discover. The framing device, with teen Billy off fighting World War II, was an effective way to give the story some context and a powerful conclusion, I thought. Edwin: The filmmakers certainly did their homework on the casting front and I’m right there with you on the screenplay’s structure. Factor in consistently gorgeous nature photography and I’m a little confused why Goodbye Christopher Robin is taking at the box office. Is it simply that it’s not the cheery, family-friendly biopic its trailer suggests? Bruce: I think viewers might find they wanted a little more Pooh to balance the angst. While we see Shepard’s well-known illustrations, there’s barely a quote from the Pooh stories. There may have been rights issues, but it’s a gap in the telling, like a movie about a painter that shows none of his works. I think the movie works as is, largely thanks to Macdonald, but it would have been a richer portrait with a bigger dose of Winnie magic. I’ll give it a B-plus. Edwin: Have you been looking at my notes? We’re in agreement here as well — and I definitely would have welcomed a hand-drawn animated Pooh and his pals traipsing through the forest, or some equivalent. Even without those touches, the film is a surprisingly adult look at childhood and its myriad influences. B-plus here, too.